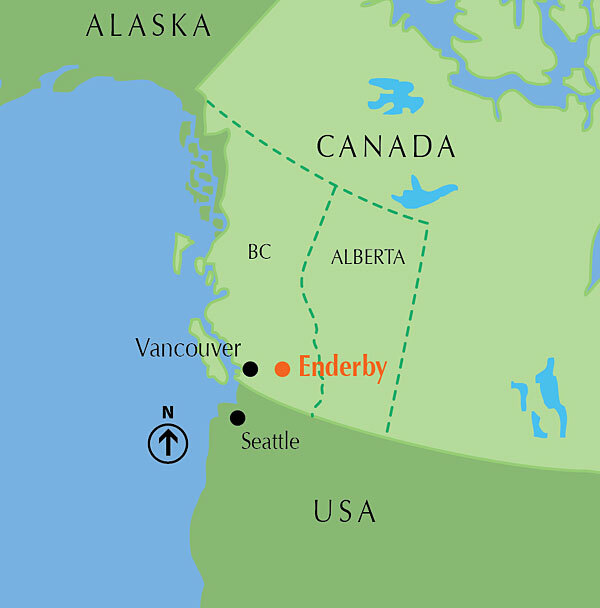 The City of Enderby is in the south-eastern interior of British Columbia, in a rural area between Vernon and Salmon Arm, five hours from the Lower Mainland and five and half from Calgary. It sits along the shores of the Shuswap River, on BC Highway 97A, just 40 kilometres south of Sicamous and 36 kilometres north of Vernon. 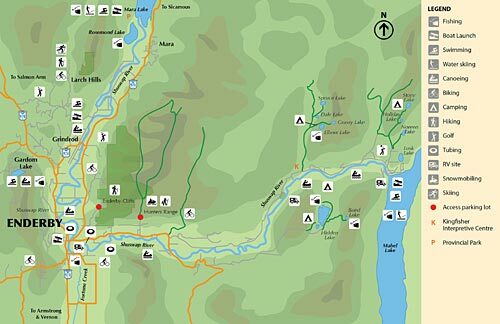 Follow BC Highway 97A north from Armstrong or south from Sicamous and you’ll find Enderby & District hugging the shores of the Shuswap River half way between its headwaters at Mabel Lake and its final destination 56 kilometres further upstream at Mara Lake. Ashton Creek, Grandview Bench, Splatsin, Kingfisher and Grindrod fill out our District, alongside the Hunters Range and the magnificent Enderby Cliffs. 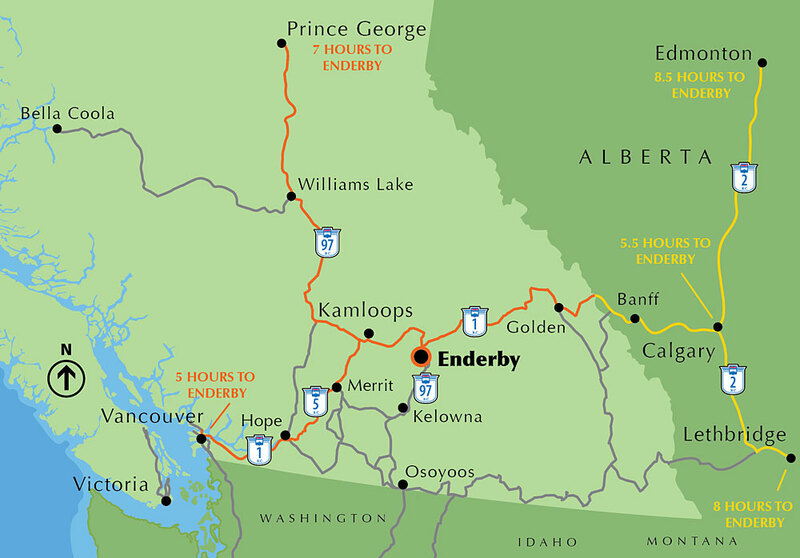 Your main access point to Enderby & District is via BC Highway 97A, a tributary of BC Highway 97 that connects Vancouver to Kamloops in the west, and Osoyoos, Kelowna and Vernon in the south. Highway 97 also connects to the Yellowhead Highway to Jasper via Kamloops or to the Trans-Canada Highway to Calgary via Highway 97A in Sicamous. If flying is more your style, we’re just over a one hour drive from either the Kamloops or Kelowna Airports. Small, personal aircraft can land at nearby Mabel Lake Airpark. We’re not your typical tourism destination, in fact, when it comes to certain things like accommodations — booking ahead is a good idea, particularly during the summer, to avoid disappointment when you arrive. For accommodations in the city of Enderby you’ll find modest family-run motels and inns, along with familiar brand name accommodations clustered along the highway as you enter the city. Outside Enderby you’ll find countryside B&Bs, RV resorts, provincial park campgrounds, cabin rentals and a seasonal lakeside resort. Camping is available throughout the Enderby & District in private campgrounds and resorts. Reservations can be made at private campgrounds more than three months prior. Our Visitor Centre is located right in Belvidere Park by the river at the start of our Heritage River Walk. Located three blocks off of 97A, turn east on Cliff Avenue then, turn right after the railway tracks. You’ll find picnic tables and plenty of parking (including RV parking) and a lodge-pole pine log cabin where our staff can answer any questions you may have as well as provide you with information, directions, advice, local knowledge and assist with making your reservations. Our building is also equipped with free WIFI Internet access if you need a hot spot. While you’re there, be sure to pick up some brochures, maps, and other essential travel information for your trip. Fishing licenses can be purchased on-line, at Service BC in Vernon and Salmon Arm, or at select retail outlets in Enderby and Ashton Creek. Visit BC Provincial Fishing website for more information. Seat belt use is mandatory for all drivers and passengers in Canada. The Distracted Driving Law is in effect in British Columbia, which prohibits drivers from talking, texting or emailing on hand-held communication devices, and using other electronic devices while behind the wheel. The diversity of Enderby’s activities calls for shrewd packing. If you’re heading into the mountains for any sort of outdoor adventure, it’s best to dress in layers. Our restaurant scene is pretty laid-back, so casual attire is the order of the day. We’re known for our hot summers, but remember to bring sunglasses and a hat to provide protection from strong sunlight no matter the season.